The 8,300-acre Tres Alamos Wilderness in the southern Black Mountains is a mix of high ridgelines, deep canyons, sandy washes, desert slopes, and plains. The high point is Sawyer Peak (4,293'). The most striking features of the Tres Alamos Wilderness landscape are colorful columns of stone in the mountainous areas. The western slopes and plains carry lots of saguaro and paloverde, creosote bush and Joshua tree, while the washes are lined with acacia and mesquite. This is another area of Arizona where the Gila monster is alive and well. The hiking and camping here are pretty easy (as long as you stay in the sandy washes) but there are no maintained trails. 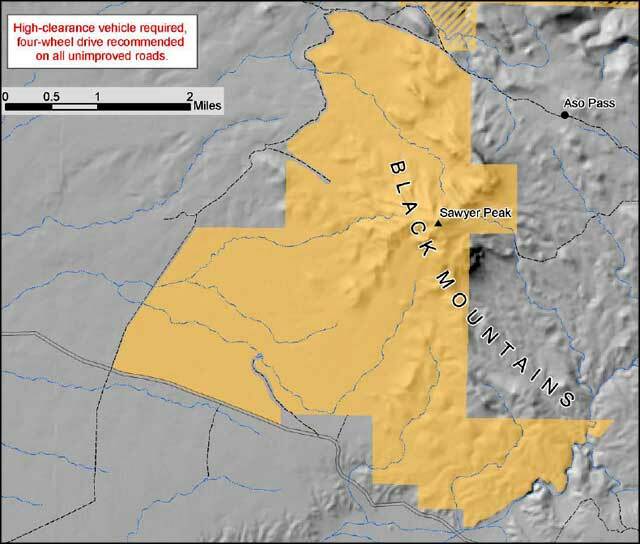 And just because the map below indicates roads in the area, don't count on being able to access them with a vehicle: this is designated wilderness. Best time to visit: October through April. From milepost 179 on US 93, follow the Alamo Road west for 6.5 miles to the Pipeline Ranch Road. 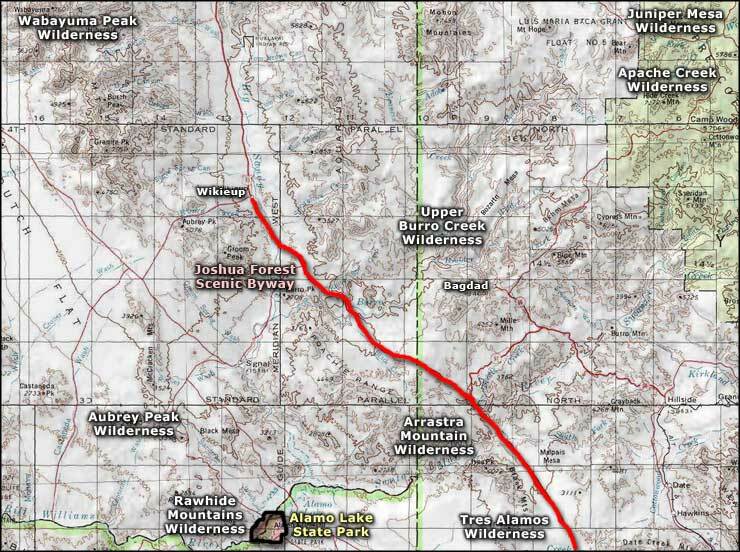 Follow the Pipeline Ranch Road north about 7 miles to the southern boundary of Tres Alamos Wilderness. Every road in this area requires high clearance 4WD, especially the area around Date Creek near the southern boundary. Upper map courtesy of the Bureau of Land Management. Area map courtesy of National Geographic Topo!